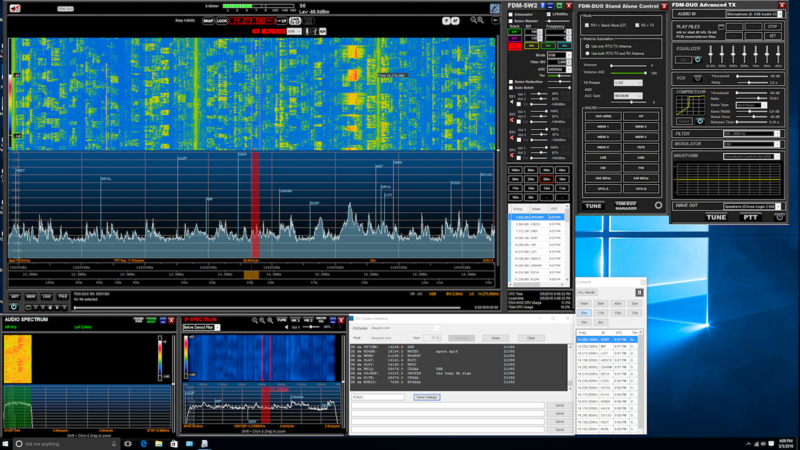 FDM-SW2 software during DX contest with DX spotting on. that is the frequency display with some other tuning related buttons plus the zoom controls. Below the spectrum display is a three bar tuning system that allows you to quickly tune the systems by dragging the bars back and forth. The bottom bar lets you select the band, the middle lets you quick tune through the MHz range, and the top bar tunes in the kHz range. Very convenient. The right side of the screen contains most of the signal controls. Here you can switch on the attenuator, noise blanker, adjust the manual notch filter, turn on and adjust the auto notch filter, turn on and adjust the noise reduction feature, etc. This area also contains the band switch buttons and memory information when in use. This area also includes turning off and on the other three VFOs labeled RX-1 through RX-4. Clicking one of the colored RX buttons will turn the VFO on and show a matching color tuning bar in the spectrum window. The bar can then be dragged to a specific area of the spectrum or waterfall display to tune to a frequency. Clicking the button again will turn the VFO off. Each VFO can have it’s own mode settings, filters, etc. Each VFO’s volume and squelch can be independently controlled as well. The volume sliders for the VFO’s can be used to route it’s audio to the left or right channels or both. All in all a very powerful way of monitoring and controlling multiple signals. At the the very bottom left is the SET button used to bring up the settings menu. Also you will find the MEM, LOG, and FILE buttons nearby. Below that are the control buttons for the audio recorder as well as the Power button that starts the software running. The receive mode selections are CW, CW SH+, CW SH-, CW NW, USB, LSB, AM, FM, DRM, WB FM, SYNC AM, DSB, RTTY and ECSS. Oh, wait does the FDM-SW2 decode DRM? You betcha! Nothing to add just select the mode and go. When you do select DRM you get a couple of extra buttons. One brings up a tuning and information type display and the other brings up a current schedule and frequencies of DRM stations. Just click on the station frequency and the FDM-SW2 will automatically tune to the selected frequency. somewhere very precisely, double clicking on the frequency display will bring up the Quick Tune feature where you can enter a frequency directly. One of the super nice tuning features is the FDM-DUO’s VFO knob can be used to fine tune a signal in some configurations. This is incredibly handy because you can click on a signal and then use the FDM-DUO’s VFO knob to fine tune the signal. Also if you stay in one of the non remote modes, the FDM-DUO’s frequency and status display remains active. When you activate one of the software receivers (remember one is always on by default) two additional windows will be available. On is an IF Spectrum display window and the other is an Audio Spectrum. These windows also have their own settings and adjustments which we won’t go into here but you may find useful. Each VFO when activated gets it’s own IF Spectrum window. Of course these windows can be closed or resized. So if you are using two software receivers in 2 channel mode each with it’s own Spectrum, Waterfall display, Control Panels, and each has it’s own set of IF Spectrum and Audio Spectrum displays, and not to mention the 6 additional VFOs IF Spectrum windows if used, you could have up to 12 windows available. It might be time to get a bigger monitor or multiple displays. In case you are wondering a good bit of these windows parameters and colors can be tweaked under the Graphics tab in the SET mode. Heck, you can even change the FDM-DUO’s LCD to custom colors using the FDM-Manager feature of the FDM-SW2 software. Clicking on the FDM-DUO button near the top of the FDM-SW2 screen will open the FDM-DUO Stand Alone Control Panel. This panel brings up some settings to allow you to directly control the FDM-DUO hardware. You can change the power output, antenna configuration, and put the radio into the Tune mode. It will also bring up the Macro panel with some default macros in place. You can design and add your own macros to automate certain functions within the FDM-DUO hardware. If you have the CAT USB connector plugged in, you can click on the FDM-DUO Manager button. This feature will allow you to program, label and edit the 200 memory locations in the FDM-DUO. You can also program 10 CW messages that can be stored in the FDM-DUO for transmission. The FDM-DUO’s back-light color can be set in the Manager by manipulating the RGB sliders to correspond to 5 different mode configurations. If you have one of Elad’s preselectors, you can set up the filter settings in the Manager window. The FDM-SW2 software also features a very basic logging feature for logging contacts. Very simple at this point, but handy to have nonetheless.